I enjoy Dr Barbara Garcia, she is a great doctor and cares about my personal health. I've been her patient forover 10+ years. I enjoy Dr Barbara Garcia, she is a great doctor and cares about my personal health. I've been her patient for over 10+ years. Always a pleasant visit. Dr. Garcia is easy to talk to and she listens for input. Thank you for scheduling your appointment with our office. New patients are required to arrive 30 minutes prior to appointment to complete registration. If you were unable to provide any insurance information at the time of scheduling, please contact our office with your insurance details prior to your appointment. If we do not hear from you, your account will be considered self-pay and any charges will be due in full at the time of service. Barbara Garcia is a skilled and trusted family physician based in Phoenix, AZ. Dr. Garcia earned her degree in medicine from the University of California, Los Angeles. She completed her residency in family medicine and obstetrics and gynecology at Saint Joseph's Hospital and Medical Center. Dr. Garcia is a part of Abrazo Medical Group Maryvale Family Medicine, and is affiliated with Abrazo Maryvale Campus, Phoenix, AZ. She is a member of the Arizona Latin-American Medical Association. Dr. Garcia is also board certified by the American Board of Family Medicine. Dr. Garcia speaks English and Spanish. Her awareness of these different languages makes her accessible to patients from a variety of cultural backgrounds. 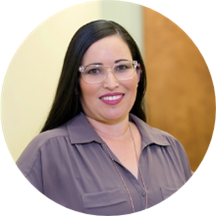 Dr. Garcia conducts her appointments with the personalized care and attention that she would expect for her own family. Great! I always have a great visit because I love my doc. I've been seeing her for many years.